Are Tennis Balls Safe for Your Dog? As the first signs of spring beckon for outside play, ball-crazy dogs are ready for the game that always results in joy: fetch. The sole equipment necessary for this sport is the ball -- the tennis ball, to be precise. But some controversy exists over which ball is the perfect one for throwing. Apparently, there are tales of tennis ball fuzz wearing down dogs' teeth and, worse, cases in which dogs have nearly choked on the ball. I don't put much stock in either of those tales. Most dogs can use a tennis ball safely. In fact, I find that the outer coating of the tennis ball actually helps reduce plaque on dogs' teeth. And as far as the choking hazard, there might be a rare dog that's incompatible with tennis balls, but it's uncommon. If your dog is a larger breed, such as a German Shepherd, gauge the size of his mouth and whether it looks like he is more suitable for a larger ball or a dog tennis ball with an attached handle. The choking cases that have come through my emergency practice are dogs that have either small, hard plastic balls or dense rubber SuperBall-type balls lodged in their throats. These balls cannot be compressed like a tennis ball, making them more likely to get stuck. For that reason, I absolutely discourage the use of those balls. - Always supervise when your dog has a ball (or any toy, for that matter). - Don't let your dog carry the ball home. He needs his mouth to pant in order to cool down, especially after a hard run. - Throw away worn or chewed-up tennis balls or other balls. 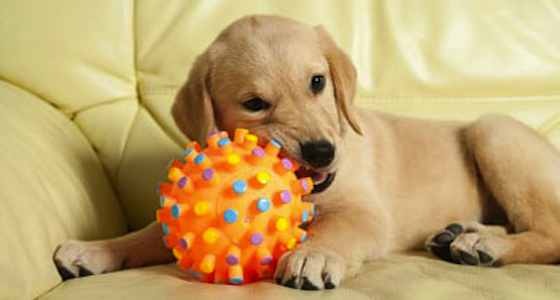 Make sure the ball has not gotten to the point where it's been chewed into small pieces that can be easily ingested. If your dog does end up choking on a ball or toy, you can take him to an emergency animal hospital, where they will put him under quick sedation to remove the obstruction. If he is showing acute signs of severe choking (e.g., his gums turn blue, he passes out, etc. ), you might have to take the situation into your own hands and carefully dislodge the ball yourself. You can attempt the Heimlich maneuver by lifting up his front paws, with your dog facing outward, and using your fist to thrust upward just beneath the rib cage. Another option -- with a greater risk of getting bitten -- is to reach in through the mouth to try to free the ball. Pets | Dogs: Are Tennis Balls Safe for Your Dog?